New works exploring the wide-ranging ways of synthesizing saxophone and voice by Felipe Lara, Kate Soper, Erin Rogers, Zach Sheets, Chris Fisher-Lochhead, and Dave Reminick. From haunting whispers to nonsensical shouts, each composer uniquely integrates the human voice. I am thrilled that my work Shimmering Dust for flute/cymbal has been selected for performance on the 2017 Bowling Green New Music and Art Festival! Works by Cydonie Banting, Michael Eckert, Erin Rogers, Robert Gibson, Kevin Puts, Ao Xiang, and Steven Mackey. Known for exciting performances and elaborate stage setups, Hypercube has built a reputation on delivering impressive execution with a rock-and-roll edge. 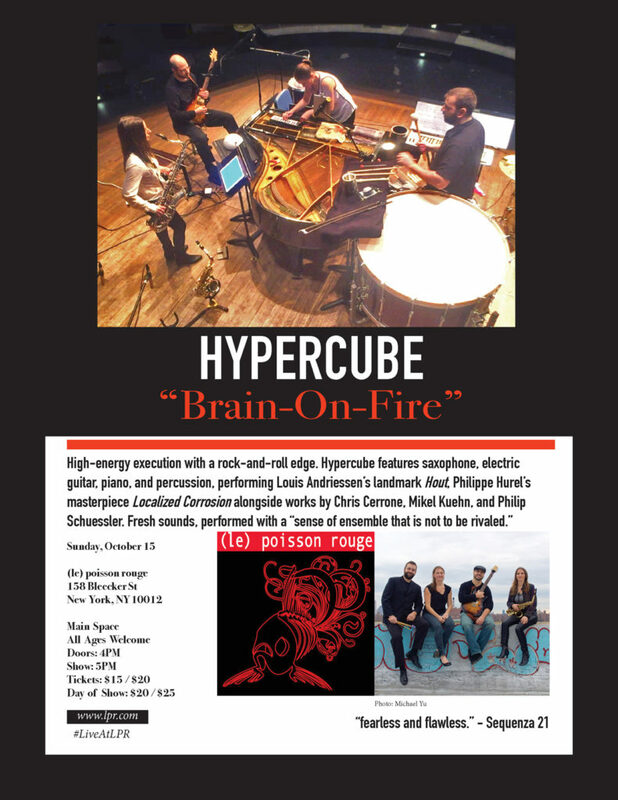 On Sunday, October 15th, the ensemble takes the stage at Le Poisson Rouge to perform an evening of high-energy works for saxophone, electric guitar, piano and percussion. Featuring Louis Andriessen’s landmark work Hout, and Philippe Hurel’s spectral masterpiece Localized Corrosion, the program will highlight the contemporary voice of Chris Cerrone, the intricate timbres of Mikel Kuehn, and the rhythmic grit of Philip Schuessler.